A week or so after that, I found out that my grandmother had passed away and we drove down to the Mississippi Gulf Coast—where I grew up—to attend her funeral. It was obviously a very sad occasion, but my grandmother lived a very long life and died peacefully. I also found out that she had a top secret job as a Japanese code breaker in WWII. She apparently wasn’t allowed to tell anyone about what she did until it became unclassified recently. How cool is that? I hadn’t been back to the Gulf Coast since we moved away when I was in 6th grade so it was nice to be able to visit and to see family. Unfortunately, Hurricane Katrina did a LOT of damage down there and they are still recovering all these years later. My elementary school and one of the houses we lived in were completely blown away and they’re still just empty lots. It was sad to see, but I’m glad I got to show Brandon where I grew up. This recipe is slightly adapted from the huge Cook’s Illustrated Cookbook . Brandon gave it to me as a birthday gift recently and as I was looking through it, these jumbo bakery-style muffins were one of the first things to jump out at me. Through their usual rigorous testing, they found that low-fat yogurt was the best way to get muffins that are tender and moist inside but with a thick crust and puffy top. 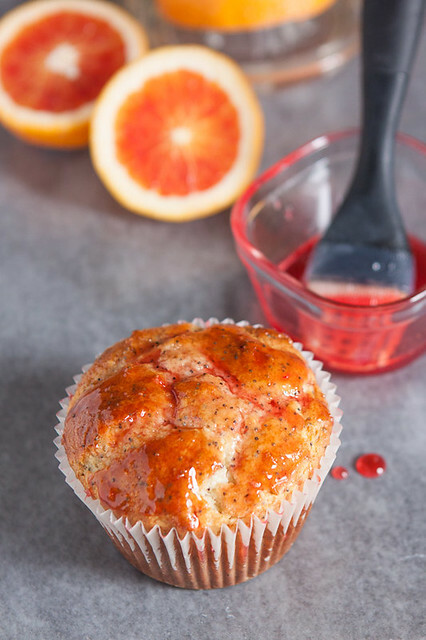 I already made the normal lemon poppy seed version a few weeks ago but I’ve been trying to get more Vitamin C into my body to help this cold and I had some beautiful blood oranges so making orange poppy seed muffins was a no-brainer. The great thing about this recipe is that you can use it as the basis for pretty much any kind of muffin you want. Replace the orange with lemon or any other citrus. Or mix in spices like cinnamon or nutmeg instead. Add in blueberries, cranberries, chocolate chips, raisins, nuts or whatever else you can think of (about 1 to 1 1/2 cups depending on the size of the add-in). You never quite know what you’re getting with those giant muffins at the coffee shop or grocery store, they could be pumped full of HFCS or unhealthy oils. I can’t say these are the healthiest muffins since they still contain butter and sugar, but at least you know every single ingredient that goes into them, including healthy yogurt. 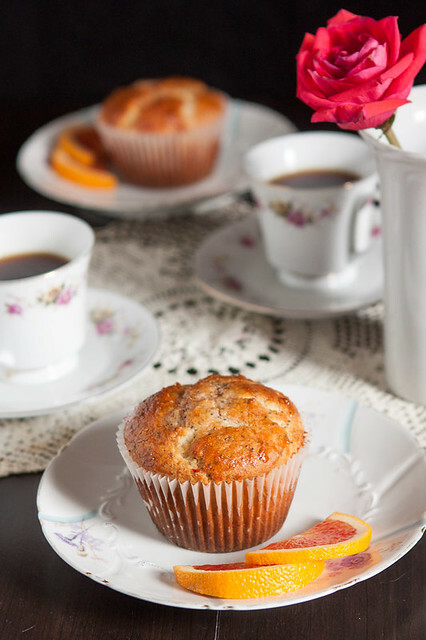 If you love those bakery muffins, these are a delicious alternative that you can make at home. Adjust oven rack to lower-middle position. Insert paper liners into or generously spray muffin pan(s). I found it better to use liners (at least for the jumbo size) because they made the muffins easier to remove from the pan. In a large bowl, mix flour, baking soda, baking powder, salt and poppy seeds. Set aside. Using a stand mixer with the paddle attachment, cream butter, sugar and orange zest on medium-high until light and fluffy, about 3 minutes. Add eggs, one at a time, mixing well after each addition. Add orange juice and mix well. Reduce speed to low. Mix in 1/2 cup of yogurt. Then mix in half of the flour mixture. Scrape down the sides as necessary. Repeat with another 1/2 cup of yogurt and the remaining flour mixture. Mix in the remaining 1/2 cup of yogurt last. Give the batter one last stir by hand, it will be thick. Use a ice cream scoop or large spoon to fill each muffin cup about 3/4 full. (Note: You can fill them up a bit more to get a puffier muffin, but make sure the top of your muffin pan is also sprayed or else the muffin tops will stick.) Bake jumbo muffins for 25-30 minutes and regular muffins for 20-25 minutes. Rotate pans halfway through baking. Muffins should be golden brown and a toothpick inserted in the center should be clean with a few crumbs attached. Immediately remove muffins by inverting the muffin pan onto a wire rack. Turn the muffins right side-up and let them cool slightly. While the muffins are baking, add the 1/4 cup orange juice and 1/4 cup sugar to a small saucepan. Cook over medium heat until the sugar is dissolved and the mixture thickens slightly, about 5 minutes. 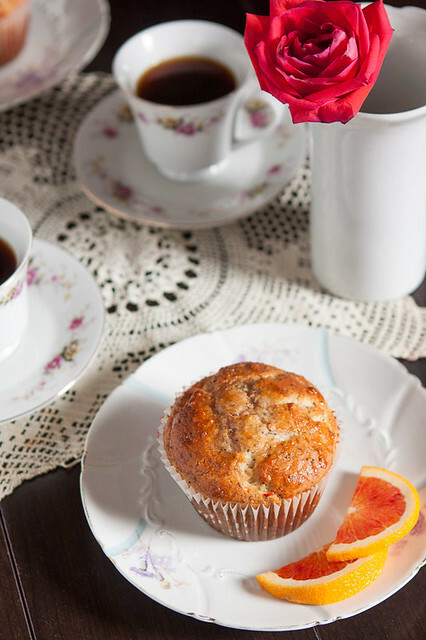 Use a pastry brush to coat the tops of the warm muffins with the warm syrup. Serve muffins warm or at room temperature. Store in an airtight container for 3 to 4 days. Sooo happy you are back. And sooo sorry about the stomach flu. That sounds horrible. I’m a dough eater, too, and I would have hated to ‘fess up to a bunch of nurses about it. 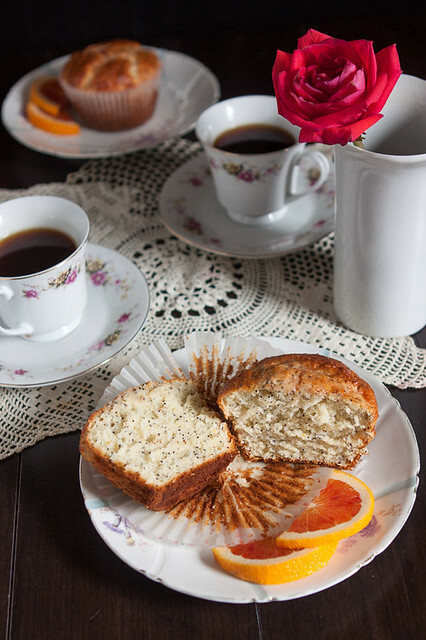 I love this twist on lemon poppyseed muffins. I’ve tried yogurt in breads before and I love the slight tang and moistness it gives the bread. I’ll have to try it in a muffin, too! What is the baking temperature for these muffins please? I baked mine at 400 degrees. I also tripled the zest and the juice of my three tangelos was 3/4 c. Amazing! Thank thanks so much for the great recipe.